March 18, Fineko/abc.az. Excelling with its innovative ideas and solutions in customer services, Azercell is pleased to introduce personal cabinet service “My Cabinet” in a more modern design for its subscribers. “My Cabinet” is a virtual assistant enabling subscribers to save time and execute majority of operations related to his/her cell number at the shortest timeframe. - track the payment history for the latest 6 month period. 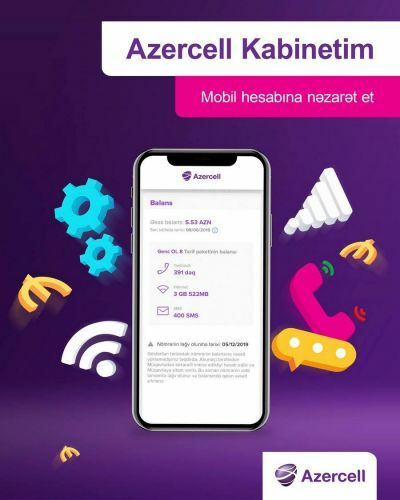 In addition, subscribers may use “My Cabinet” to top up balance, send messages, stop advertising type messages from Azercell or third parties, and also deactivate/activate Roaming, “Kəscell+”, Call Forwarding, Caller Identification Restriction, Simurq services and etc. by entering to the “Services” page. We should also mention that, aiming to apply the world’s latest digital innovations, Azercell presents the new private cabinet in a “responsive” design. It has a flexible design to match the size of the user’s screen and so automatically adapts to the screen and browser size based on settings of device used. One more new feature of “My Cabinet” is the availability of “Fast login”, which provides an opportunity to enter into the cabinet with a one-time password. We strongly believe that “My Cabinet”, which allows online execution of a range of operations, will please our subscribers and will be beneficial by making their daily live activities easier.